Farrow & Ball wallpaper at Chateau de Bignicourt; Pretty in “Nancy’s Blushes” Pink from Farrow & Ball; The Bailey Chair is covered in Aura, a Crypton Home Fabric offered by Thibaut Wallpaper Fabrics & Furniture. The drapery fabric is called Open Spaces from Thibaut’s new Summer House Collection. What’s in a space? Any of the interior designers, architects, or builders featured in this special Hinsdale Living Home & Design edition will tell you it’s a delicate balance of structure and style and just the right finishing touches. 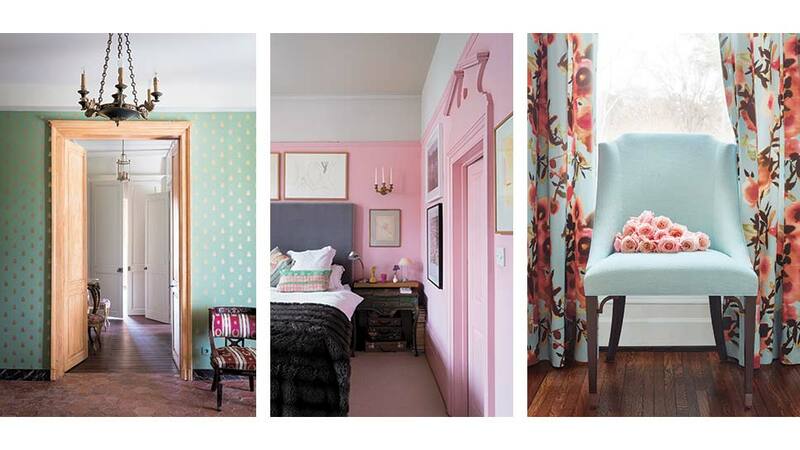 With that in mind, we were intrigued to learn that two of the interior design world’s most coveted purveyors were coming together in Hinsdale this spring for presentations about how to make color, wallpaper, and fabric add depth to any home decor. Sharon McGuckin of Farrow & Ball joined Kimberly Colarossi of Thibaut Fine Furniture at JC Licht on March 16 to talk about how to make the right choices for your home. It is the perfect marriage of iconic British style and classic American sensibility. Founded in 1886 by Richard Thibaut, Thibaut Fine Furniture started as an all-American wallpaper company (once called “the world’s largest”) and now is as well known for its luxurious custom furnishings as its luxurious fabric. Farrow & Ball’s story followed 60 years later in Dorset, England when John Farrow, a trained chemist who worked for Ireland’s Agnew Paints during World War II, met Richard Ball—an engineer who survived capture as a prisoner of war. The pair met at a local clay pit and shared a passion for making rich colors to original formulations. Today, both brands are distributed world-wide and are sought-after by local interior designers. Thibaut offers a modern approach to classic interiors while Farrow & Ball seeks to preserve the look and feel of ancestral properties with rich, historic colors that have not been available in recent decades. Those attending the March presentation surely left feeling inspired to infuse their interiors with color and texture. Here are some new looks from Farrow & Ball and Thibaut to give your new decorating project a jump-start. For more inspiration, check out Farrow & Ball’s How To Decorate book available at octopusbooksusa.com.